Fresh strawberries, vanilla pudding, cool whip, cream cheese and puff pastry come together to make these Strawberry Cheesecake Napoleons. DESSERT! It’s been a while since I posted a dessert. So I’m posting one today. After all, I’ve had this Strawberry Cheesecake Napoleon recipe sitting around, waiting to be posted for almost two months now. It deserves some much needed blog love. Oh so that’s the dessert you wanted, eh? Well let me share a little secret with you. That dessert right up there is easy to make. A little messy, yes, but easy, nonetheless. I said “oh I want to make a sweet treat.” My freezer replied “there’s a neglected box of puff pastry weighing me down inside, hint hint.” So I saved my freezer from the agony of being weighed down by a box of puff pastry, grabbed that box of puff pastry and then BOOM, there’s a napoleon recipe glaring at me. I love it when my food talks to me – translated: I love it when food packages give me recipes to try. I pretty much followed the recipe to a T but I got a little creative and added some cream cheese to the mix to make it sorta cheesecake-esque. Keyword: a little creative. I don’t know how creative throwing cream cheese into a recipe is but I felt creative at the moment and that’s what counts, right? Place the puff pastry pieces on a baking sheet. Bake at 350 for about 15 minutes. Remove from the oven and allow to cool. After the pastry is cooled, cut into 6 even sized pieces. Combine the milk and the pudding. Whisk in the cool whip and then beat in the cream cheese. Spread some of the pudding mixture onto two of the puff pastry pieces. Add a layer of strawberries and then another layer of the pudding mixture. Take two more pieces of puff pastry and place on top of each section. Spread each piece with some pudding, strawberries , the remaining pudding and then top each section using the remaining two pieces of puff pastry (reference photos for examples.) Dust with powdered sugar and then top with shaved chocolate. So how about dem apples? Er how about dem strawberries? Can I please eat this through the screen?! Come to Virginia and take over my kitchen! I am getting ready to make these but as I was reading the instructions it said cut puff pastry into 6 pieces shouldnt it be 9 pieces the bottom then the middle and you said remaining 3 on top so that would make it 9 wouldnt it? It’s supposed to say the remaining 2 pieces. I will update the recipe. Thank you for bringing this to my attention. 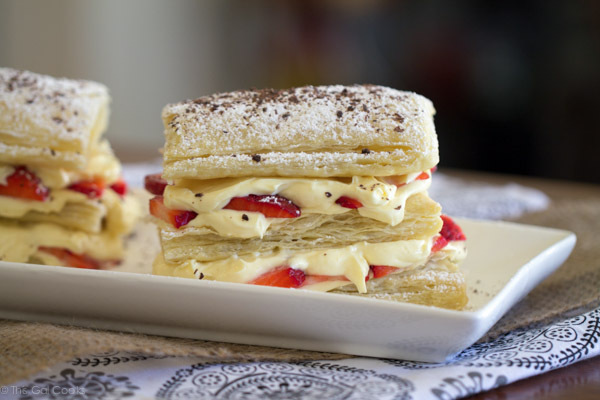 I can’t ever pass up a strawberry dessert and these napoleons look divine! I’ve been craving something sweet lately and this would be perfect! I just want to lick my screen. I love strawberry desserts and you had to combine it with cheesecake…yummm!!! These are perfect and stunning!! Can puff pastry use your picture on their packaging? Because I am sold!! LOL, you crack me up, Zainab! Glad you love this recipe. Seriously, you should give it a try one day. 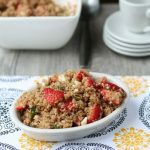 So easy to make, so tasty to eat! Ok, those napoleons sound and look amazing. Cheesecake is totally one of my favorites, and this looks super easy to make. Can’t wait to give this one a try Julie, YUM! Easy and delicious! I think it’s a brilliant dessert! What a beautiful dessert. 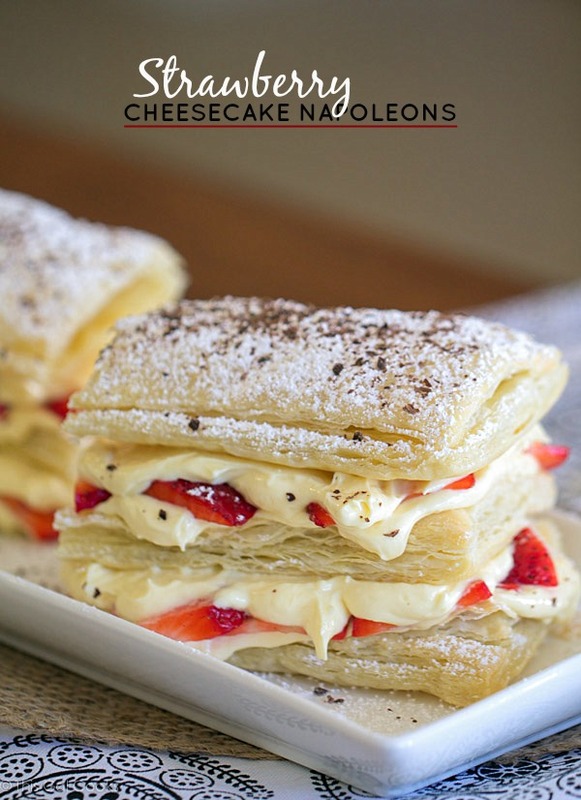 I happen to adore cream cheese and would love to try a Napoleon with that delicious looking filling. Napoleons are my very favorite dessert at Epcot in Disney World! I love your version!! What gorgeous little treats! These look amazing. 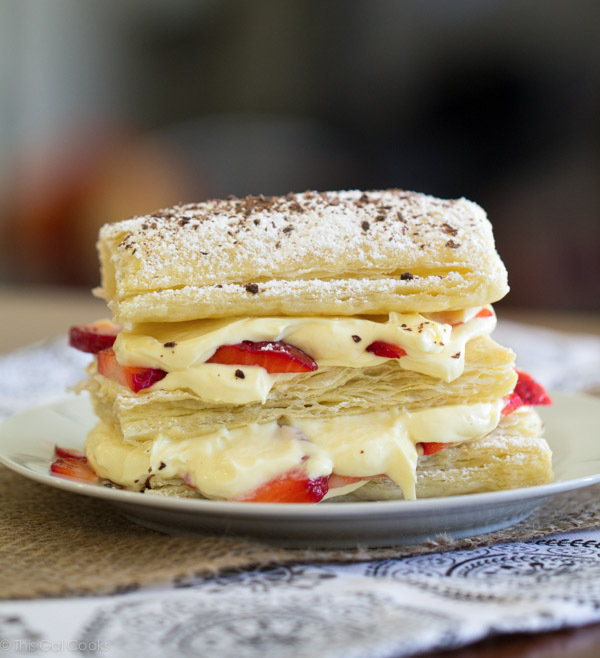 I wish I had some talking puff pastry in the freezer right now too, because I’d love to make this! What a gorgeous dessert, it looks so impressive yet it’s so easy to make yay! Wow, that looks amazing. Love the photos! Saw Nikki feature this! 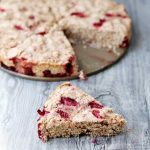 Pinned – looks delish! I am okay with messy if it means I get to eat this! Messy is mah middle name…sometimes. Ugh, sometimes I make such a huge mess in my kitchen. Fun times those are, fun times. Thanks for stopping by, Nancy! 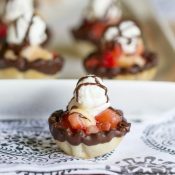 Pingback: 50 Strawberry Recipes - Chocolate Chocolate and More! I want to make these for the upcoming holidays. Can these be made ahead of time and kept in the fridge? Thank you for the reply, Julie. I’ll try to plan them so they are served shortly after they are prepared. I can’t wait! If this dessert sits out for a while, the puff pastry will begin to get soggy.The outer part of the pastry should be fine but the parts that the pudding and strawberries come in contact with will become soggy. I hope this helps.